Cleans, freshens and removes odours. Easy to use deodorising cleaner for all non waterproof footwear, including shoes, sandals, insoles and footbeds. Nikwax Sandal Wash™ is environmentally friendly; it is non-hazardous, WaterBased and biodegradable. Nikwax Sandal Wash™ is the product of choice of professional Outdoor trainers. Nikwax Sandal Wash™ is a highly effective cleaner and deodoriser which has been specifically designed and optimised to clean and deodorise all non waterproof footwear, including shoes, sandals and next to skin areas of footwear, such as insoles and footbeds. If you have waterproof footwear use Nikwax Footwear Cleaning Gel™ to revitalise water repellency and breathability. Nikwax Sandal Wash™ removes the build up of dirt and body oils from non waterproof footwear, as well as insoles and footbeds. Thereby reducing the growth of bacteria which cause odour to build up and rot materials and stitching. This has the added benefit of extending the useful lifetime of treated items. Recommended for CrocsTM, Birkenstock®, Keen® and TevaTM footwear. Rinse item with clean water to remove loose dirt and to dampen surface. Apply generously over the area to be cleaned. If very dirty scrub with a stiff nylon brush (e.g. nail brush). Dry away from direct heat. Note: Colour may run, test on a hidden area first. For cleaning waterproof footwear use Nikwax Footwear Cleaning Gel™. Leave footwear to dry at room temperature. Paper can be stuffed into the toes to absorb excess moisture; this should be replaced when wet. Keep footwear away from fires and radiators, drying too quickly can crack leather and cause bonded soles to peel. Birkenstock Arizona is now in lightweight EVA material. The beloved BIRKENSTOCK classic, Arizona, can now also be worn in wet areas, thanks to the use of high-quality EVA plastic. This makes the versatile sandal lightweight, flexible and washable, whilst still featuring the anatomically shaped footbed. 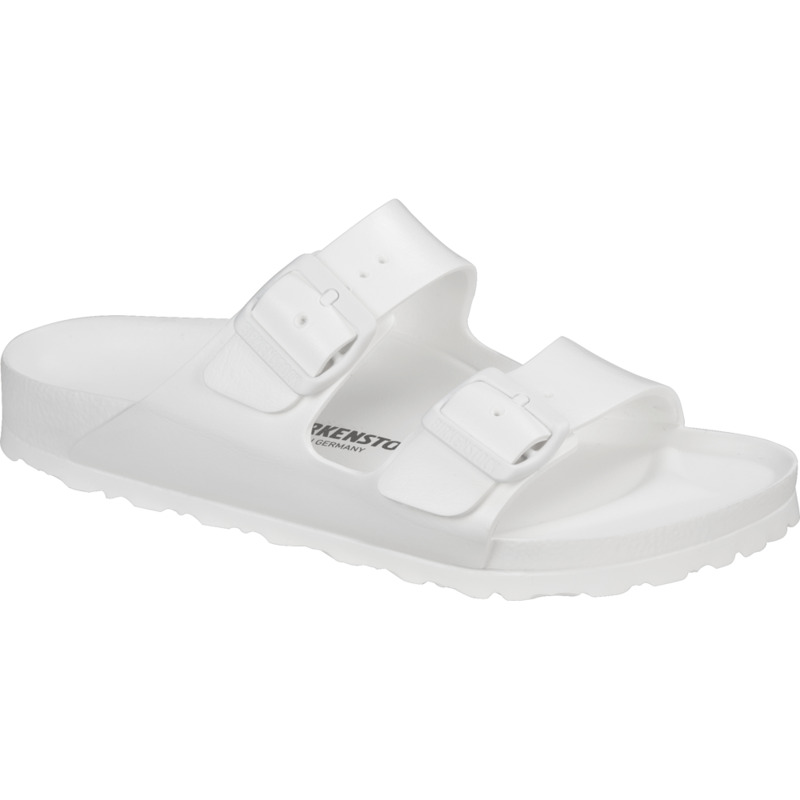 The exact 1:1 copy of the classic, which was launched onto the market some one hundred years ago, is made in Germany with the same BIRKENSTOCK quality for which the brand is renowned. The perfect copy of the 50-year-old original is now also available in high-quality EVA (ethylene vinyl acetate), thus promising a truly unique experience for the feet. After all, EVA material is extremely soft and light and also has a shock-absorbing effect. Uneven ground underfoot is automatically compensated and every step is cushioned. Another advantage is that EVA can easily be washed. This makes the sandals sturdy yet comfortable companions for wearing in a wide range of locations, from wet areas to the home, garden and beach.